A source of support or synonymous terms? Immigrants are often mentioned as a support for the solvency of entitlement programs like Social Security. But current demographic data show the foreign-born population is older, on average, than the native population. This column examines how both facts might be simultaneously true. The editorial is an example of how the ongoing immigration debate in the United States (and other countries such as Italy) often pivots on whether immigration is a net positive or negative for the native-born population. Cases can be made on both sides of the debate, as evidenced by differing analyses from the Center for Immigration Studies (CIS) and the Economic Policy Institute. Given this narrative, one might expect the median age of the foreign-born population to be significantly lower than the median age for the native population (those born in the United States). However, the 2014 five- year estimates of the U.S. population show the reverse to be true. The U.S. born population has a median age of 35.9, while the foreign-born population has a median age of 42.6. This fact, highlighted in a recent report by CIS, caused one news site to headline a story “Report Obliterates Myth Immigrants Can Save Social Security.” So which narrative is true? And is the same narrative happening in every state? To get a better handle on it, I looked at the same 2014 census numbers at a state level. Comparing the native median age to immigrant median age for each state is visualized in the top map of Figure 1. Those states where the immigrant population is older than the native population are shaded red. For comparison, also provided are the map of median total population age, and the same visualization based on the median age of the foreign-born population. Figure 1 – Ratio of median age for native population divided by median age of immigrant population – Data from ACS 2014 five-year estimate. Color shows the ratio of native median age over foreign born median age. Green indicates the foreign-born population is younger than the native population. 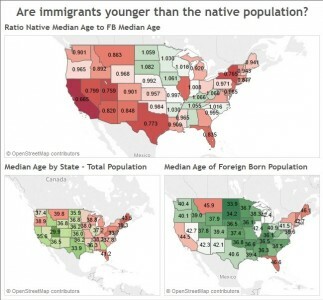 Perhaps surprisingly, the states where the immigrant population is much older than the native population are also, for the most part, states with traditionally high numbers of immigrants – California, Texas, New York, Illinois and Florida. California’s native-born median age is only 29.6, while the median age for the foreign-born population in the state is 44.5. This may be partially explained by where recent arrivals are locating. Immigration researchers have noted a shift of foreign-born populations away from the traditional gateway cities and into new destinations such as North Carolina. This may simultaneously leave aging foreign-born immigrants in traditional gateways while the newer and younger immigrants spread across other parts of the country. 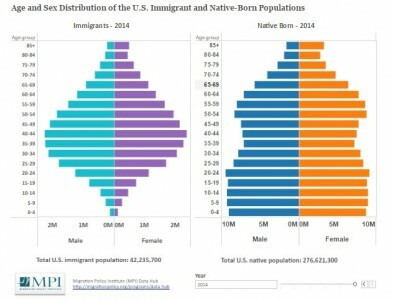 Moreover, the previous generation of immigrants may even have contributed to a younger native-born population because immigrant families often have higher numbers of children, but most of those children would be born in the United States. In fact, this appears to be what is happening in the aggregate, as shown by a table in the same CIS report. 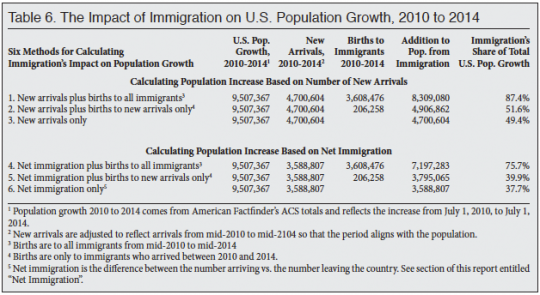 While new immigration accounts for only 49.4 percent of U.S. population growth, fully 87.4 percent of population growth from 2010 to 2014 is due to new arrivals and births of U.S. citizens to immigrants. 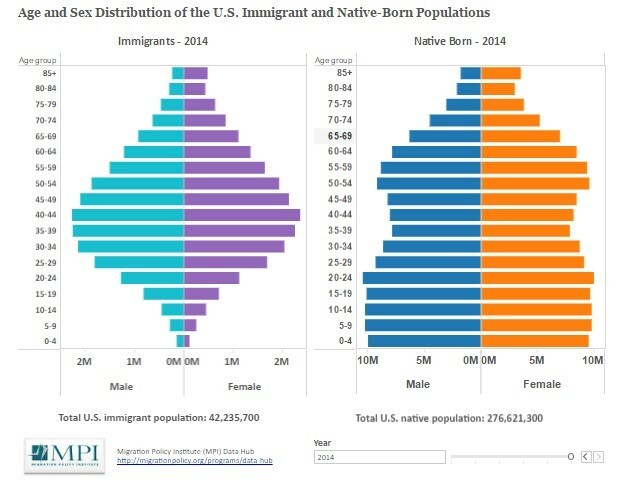 The relationship at different age cohorts between foreign-born and native populations can be seen more easily when looking at these age pyramid visualizations from the Migration Policy Institute’s Data Hub. Very few immigrants are young children, but the bulge of immigrants from age 25-44 likely contributed to the bulge among the native-born population below the age of 25. At the same time, because immigration has leveled off since the 2008 recession, the gap between the median age of immigrants and the native born may continue to grow. Past immigration may well be contributing to the stability of government entitlements at the same time that the foreign-born population is graying, with requisite impact on the need for quality health care for that population. A recent report from the Population Reference Bureau makes the point that for public administrators, this dual reality means thinking about how to serve elderly immigrants in their communities is just as important as thinking about how to meet the needs of increased numbers of children of immigrants in school systems.